If you like sweet main dishes, this one is for you! It was delectable. The grill, I think, does make a difference, the dish sort of needs that smoky flavor that a charcoal grill adds to a dish. I'm sure this would be decent stove side or broiled in the oven, but those charcoals really did add to the yum factor. Sprinkle curry powder, salt and pepper on your pork chops and rub it in. Slice your pineapple. Get grill really hot and grill them until done. I know right? How long? Well that depends on how far your chops are from the coals, how hot your coals are, how thick your chops are. I use the hand pressure test to tell if meat is done. It take some practice but it is pretty reliable. If you press the skin between your pointer finger and thumb with your hand loose that resistance is similar to the resistance that raw meat will give you. If you loosely make a fist and press in that same spot again, that is about what the meat should feel like if you want it pink (like for steak.) Since you want pork cooked further than that, clench your fist, and then press in that same spot. That is how firm well done meat should feel. Hope that helps! In a small dry skillet, toast cashew nuts and then set aside. Melt coconut oil. Add jam, heavy cream, grated ginger (as much or as little as you like) and pepper. Whisk on high until sauce thickens. It'll take a while but then it will happen. Do not walk away or you will either have a boil over or a burnt mess on your hands. When it thickens, remove from heat and add the sour cream. Whisk it in. Taste. If it is too sweet add more sour cream. Adjust salt and pepper as needed. 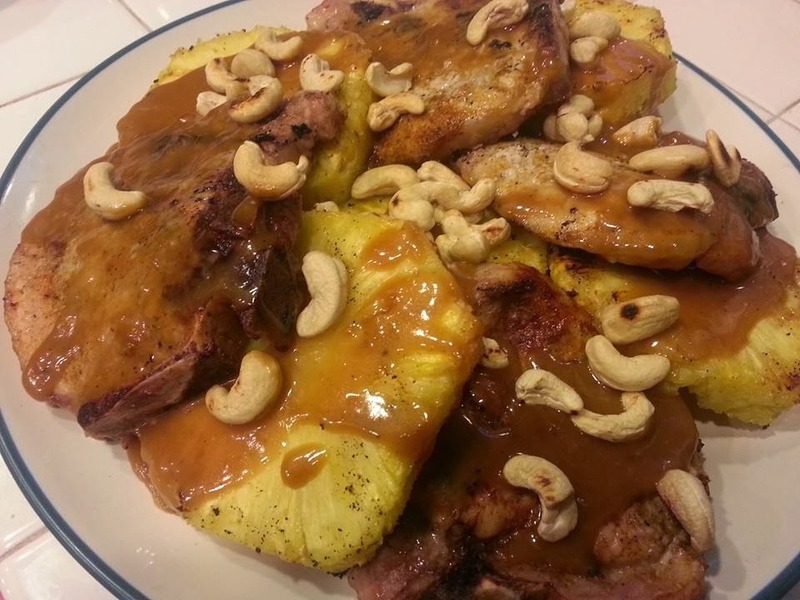 Stack pineapple and porkchops, top with sauce and sprinkle with cashew nuts. Enjoy!